Necklaces There are 45 products. 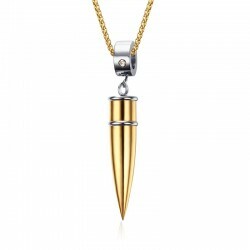 Gold plated men's necklace. Material: zinc alloy. Thickness: ~ 6mm. Please select a length. Double sided pendant necklace unisex. Material: turquoise, stainless steel. Pendant size: 40 * 38mm. Chain length: ~ 60cm. 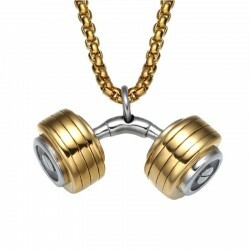 Fitness barbell men's necklace. Material: 316L stainless steel, IP gold plating. Pendant size: 3.9 * 2.4cm. 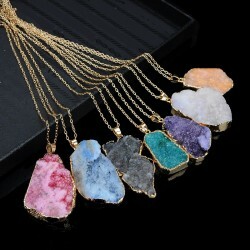 Necklace length: 60cm. Weight: 49g. 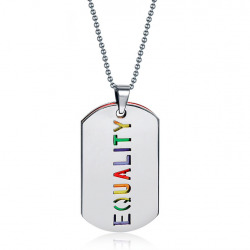 EQUALITY necklace unisex. Material: stainless steel. Pendant size: 28 * 46mm. Chain length: 60cm. Chain diameter: 2.4mm. Vintage men's necklace. Material: rosewood, stainless steel. 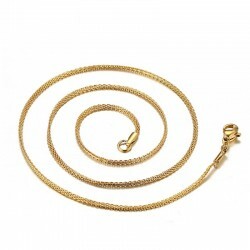 Chain length: 56 - 61cm (adjustable). Pendant size: 18 * 38mm. Weight: ~ 24g. Crystal pyramid & eye necklace unisex. Material: zinc alloy, gold plating, rhinestones. Pendant size: 3.5 * 4.5cm. Chain length: 60cm. Chain width: 0.3cm. 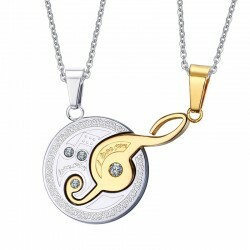 Rotatable pendant men's necklace. Material: stainless steel. Pendant size: 12mm. Chain length: 50cm. Weight: 8g. 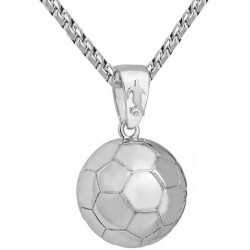 Football pendant men's necklace. Material: stainless steel, copper. Pendant size: ~ 22 * 35mm. Chain length: ~ 55cm. Weight: 30g. Please select a type. Gold, silver men's necklace. Material: stainless steel. Please select a type. Palm hand shape, necklace. Material: rhinestones, stainless steel. Size for Her: 27 * 18.5mm. Size for Him: 25 * 35mm. Chain length: 50cm. Weight for Her: 3.5g. 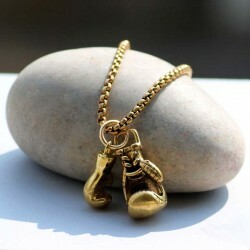 Weight for Him: 7.7g. Please select an option. Golden eagle, men's necklace. Material: stainless steel. Pendant size: 44 * 34mm. Chain length: 60cm. Weight: 16.7g. 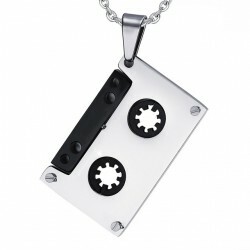 Tape pendant, unisex necklace. Material: stainless steel. Pendant size: 49mm. Weight: 12.81g. Classic design Jesus Cross, men's necklace. Material: stainless steel. Pendant size: 35 * 58mm. Chain length: 60cm. Weight: 20.6g. Please select a type. 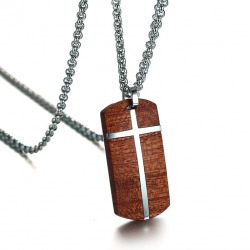 Removable Cross, men's necklace. Material: 316L stainless steel. Pendant size: 25 * 45mm. Chain length: 60cm. Weight: 15.8g. Vintage Crucifix, men's necklace. Material: stainless steel. Chain length: 60cm. Size: 33 * 50mm. Weight: 8.2g. Please select type. Spanish Cross & Bible, unisex necklace. Material: stainless steel, black plating. 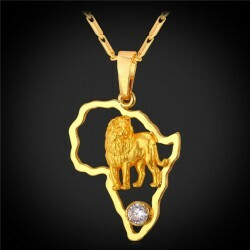 Pendant size: 32 * 52 - 62.5 * 38mm. 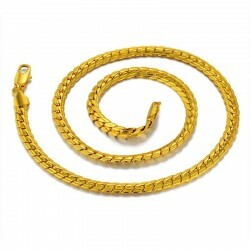 Chain length: 60cm. Please select a type. 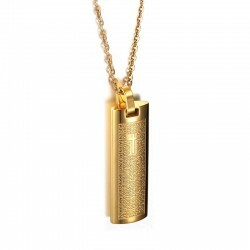 Allah Prayer, unisex necklace. Material: surgical steel. Pendant size: 25 * 29mm. Chain length: 60cm. Heart shape, unisex necklace. 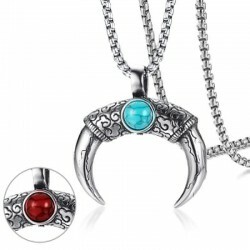 Material: stainless steel, rhinestone. Pendant size: 39 * 31mm. Chain length: 60cm. Quantity: 2pcs. Please select a type. 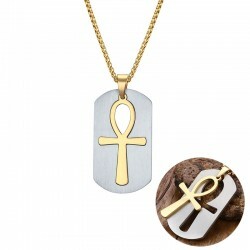 Classic Cross pendant men's necklace. Material: stainless steel. Cross size: 31 * 16.7mm. Chain length: 50cm. Weight: ~ 21.2g. Please select a color. 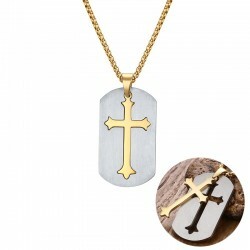 Removable cross pendant men's necklace. Material: stainless steel. Cross size: 25 * 45mm. Chain length: 60cm. Weight: 15.6g. Material: stainless steel. Pendant size: see the pictures. Chain length: 50cm. Please select a type. Gold & Silver chain unisex. Material: stainless steel. Size: see the pictures. Please select a type. 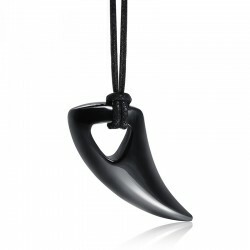 Bull horn pendant men's necklace. Material: stainless steel. Chain material: rope. Pendant size: ~ 24 * 58mm. Weight: ~ 29.5g. Please select a color. Spanish Bible & Cross necklace, unisex. Material: stainless steel. Pendant size: 12 * 37mm. Please select a type. 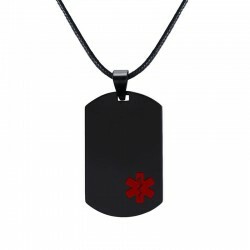 Medical sign pendant necklace unisex. Material: stainless steel, black plating. Chain material: PU leather. Pendant size: 42 * 26mm. Weight: 15.3g. 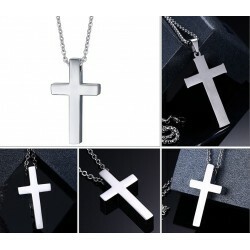 Cross pendant men's necklace. Material: tungsten carbide. Chain material: PU leather. Cross size: 12.5 * 24mm. Chain length: 50cm. Weight: 6.8g. 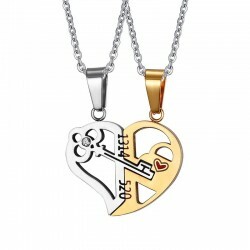 Music design, couples necklace. Material: stainless steel, rhinestones. Size: 32 * 23mm. Weight: 8.3g. Please select a type. 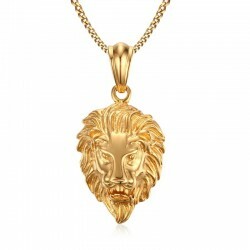 Lion head gold men's necklace. Material: stainless steel. Head size: 31 * 51mm. Chain length: 60cm. Please select a type. 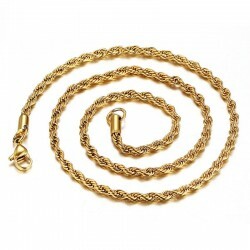 Men's gold chain, necklace. Material: stainless steel. Length: 60cm. Please select a type. 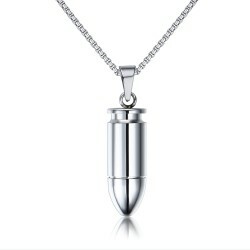 Bullet shape pendant men's necklace. Material: stainless steel, rhinestones. Bullet size: 43mm. Chain length: 60cm. Please select a type. Lucky roman numerals, men's necklace. Material: titanium steel. Chain diameter: 2.4mm. Chain length: 60cm. Weight: 11.2g. Please select a type. Cross pendant, men's necklace. Material: stainless steel. Chain material: rope. Size: 32 * 50mm. Weight: 23.9g. Please select a color. 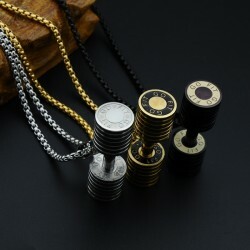 Bullet, fashion men's necklace. Material: stainless steel. Bullet length: 43mm. Chain length: 50cm. Weight: 14.2g. Please select a color. Music headphones, men's necklace. Pendant size: ~ 4.01 * 3.50cm. Chain length: 60cm. Material: stainless steel. Please select a type. Fashion, men's chain, necklace. Shape/pattern: geometric. Material: titanium, stainless steel. Thickness: 0.6mm. Chain length: 55cm. Weight: ~ 73g. Please select a type. 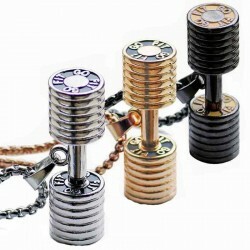 Men's, dumbbell pendant, necklace. Material: 316L stainless steel. 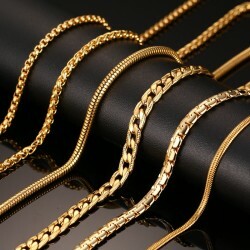 Chain length: 58.42cm / 23inch. Pendant size: 4.3 * 3.1cm. Weight: ~ 20g. Please select a color. Dumbbell, men's pendant. Material: 316L stainless steel. With Chain: no. Weight: ~ 20g. Size: 3.12cm/1.23inch. Please select a color. Men's dumbbell pendant with necklace. Material: stainless steel. Pendant length: 3.12cm / 1.23inch. Weight: ~ 16g. Please select a color. 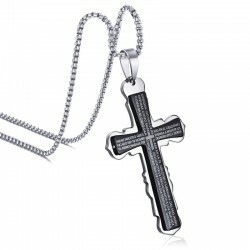 Pendant cross men's necklace. 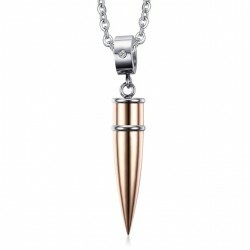 Material: stainless steel, gold plated, black gun plated. Pendant Size: 6.5 * 3.1cm. Length: 55cm. Please select a color.